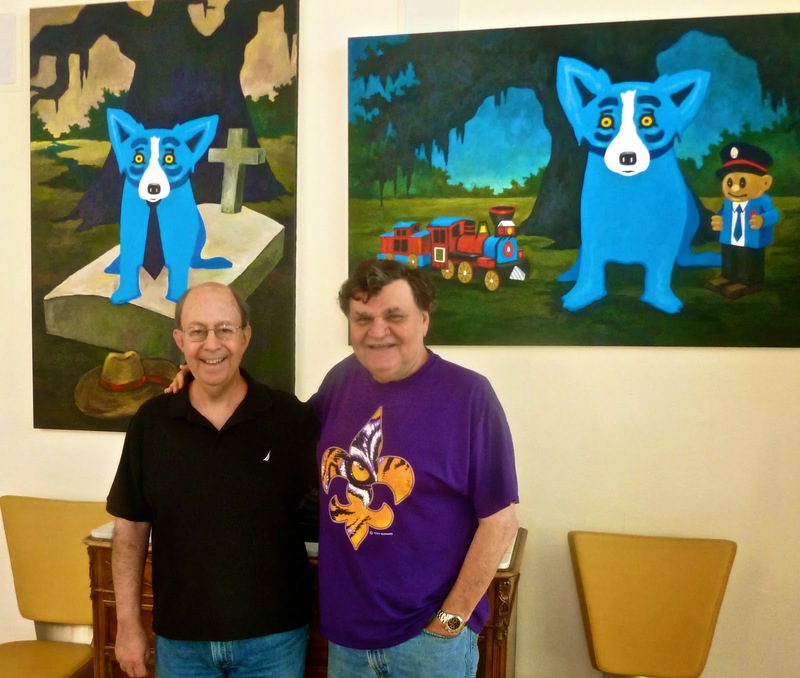 Last year I often found George Rodrigue in his studio in the middle of the night. He worked for weeks on the painting Choo Choo Ch’Boogie, yet instead of photographing him at his easel, I stood quietly behind and watched. He painted it, he explained, intending a hand-pulled stone lithograph of the image, printed in the old style in Paris, France. It would be his fourth print using this method, following Guess Who’s Coming to Dinner, a project for Amuse Bouche Winery in 2008, and Looking for a Beach House and Blue Dog Oak, both released earlier in 2013. (Click the print titles above for images and details of the process). 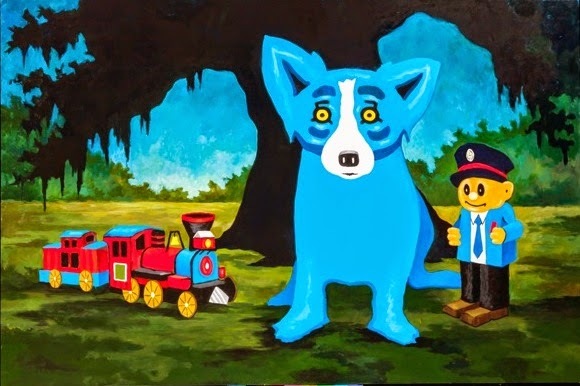 Choo Choo Ch’Boogie is a perfect example of the classic Rodrigue style: a stylized oak tree dissected by the canvas’s upper edge so that its lower branches form interesting blue shapes above the bushes. 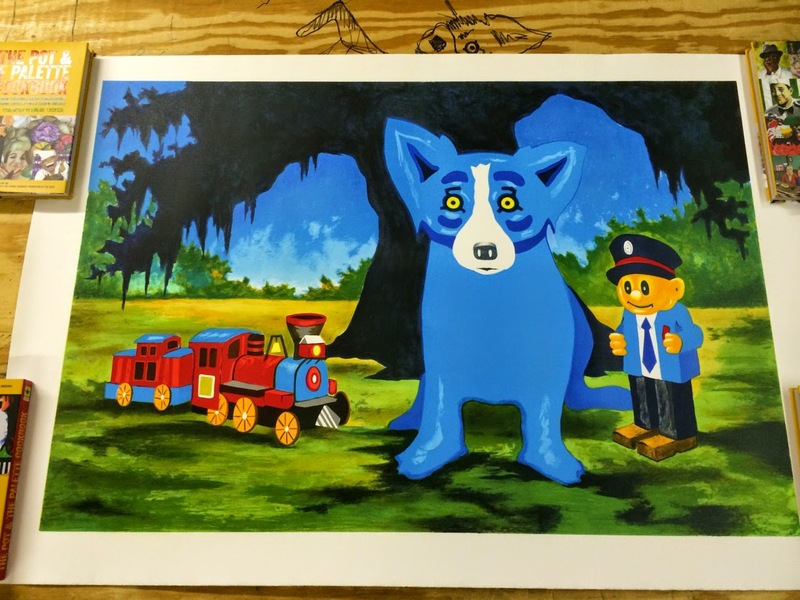 The subjects –the Oak Tree, the Blue Dog, and even the handmade carvings- connect a lifetime of painting and interests. 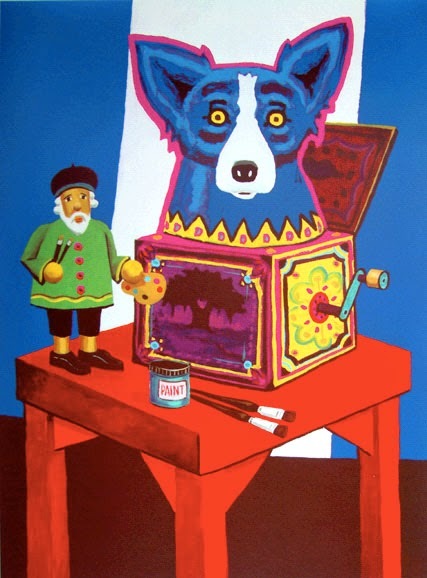 In the mid-1990s we visited the tiny town of Oberammergau, Germany, where George bought the wooden train and conductor, along with several other carved pieces, such as the artist figurine he used in Pop Goes the Revel (below), a 1998 painting and poster for the Red River Revel in Shreveport, Louisiana. 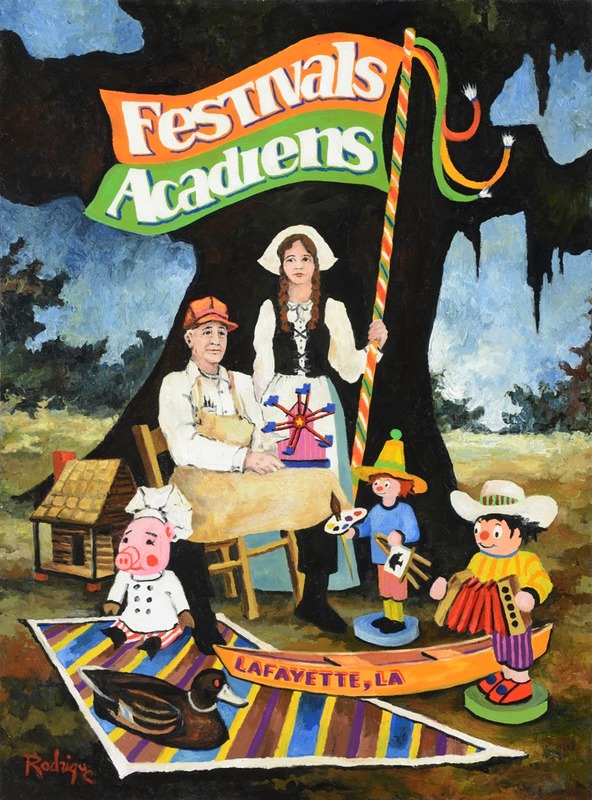 And in 1983, he used wooden figurines from an earlier trip to Germany to create the painting that would become a Festivals Acadiens poster in Lafayette, Louisiana. 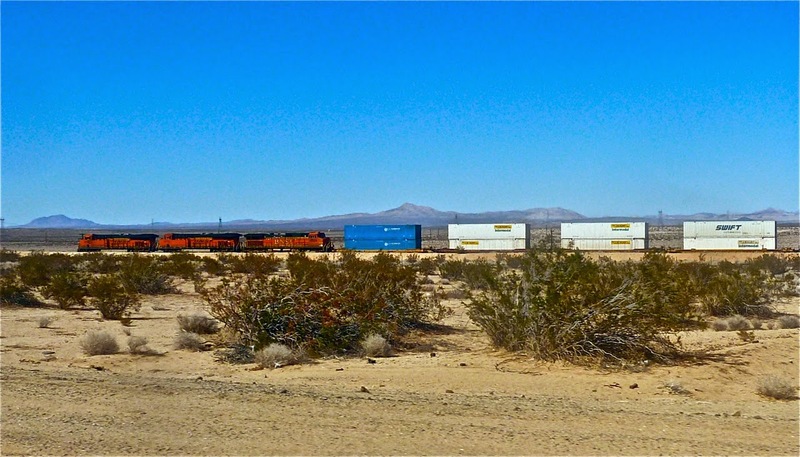 In addition, George held a lifelong obsession with trains. One year we drove in our truck to the top of Pike’s Peak in Colorado to ride again the cog train he recalled from a childhood vacation. We rode the Durango Silverton Narrow Gauge Railroad Train two years in a row so that he could experience both the open and closed cars. And it was by train that we traveled from Munich to Oberammergau to collect the wooden figures he would later use in his paintings. 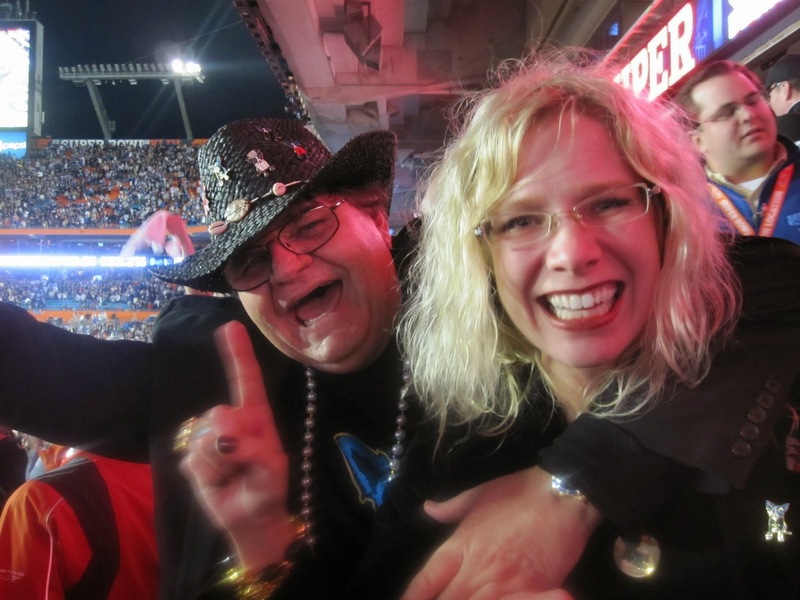 George painted Choo Choo Ch’Boogie for himself, never intending the painting for sale. He hung it on the wall of our home, alongside He Stopped Loving Her Today, his tribute to George Jones, also painted last year. George titled his painting Choo Choo Ch’Boogie based on the popular song. Although first recorded in 1946 by Louis Jordan, George probably became familiar with “Choo Choo Ch’Boogie” in the late 1950s after he got his first transistor radio, about the same time Bill Haley and the Comets recorded their version of the song for their album Rock ‘n’ Roll Stage Show (1956). His favorite recording in recent years, however, is the one we sang along with as we crossed the country annually in our truck. We grew fond of Asleep at the Wheel in the late 1990s when we toured with the band for Neiman Marcus events in Texas and Hawaii. Listen and sing along here. Just as George intended this print’s release last Christmas, he also intended that I share its history with you at that time. So this post, like the new print, is a way of following through on that commitment. Although this return to blogging is short-lived, I’m ever-mindful of George’s legacy, specifically the history behind his style and individual artworks, and I sincerely hope you’ll continue to explore the blog’s hundreds of essays. The most popular are listed by category down the right side of this page; and the rest are available through the search feature and dated archives, also located to the right. Are you scared? I asked George late one night last December, as we breathed together, my head against his chest. “No,” he laughed, a mere whisper, yet still in his Snagglepuss-style. “It’s an adventure!” he continued, perhaps thinking of the trains, his eyes wide and bright like an expressive dog’s.